Includes a bonus Dwellers Short Story (Anna's Story) and a sneak peek at David Estes' follow up YA dystopian series, Fire Country! Tristan has a secret, too, one that's been eating him up inside ever since he met Adele. Will he reveal all, and risk the loss of friendship and love at a time when he needs it the most? At the same time, Adele's mother, General Rose, must lead her soldiers into battle to face the sun dweller army in the hopes of holding them off until Adele can complete her mission. Can she outlast the strength of President Nailin's elite fighting force? There's only one truth in their world: someone must die. This series just keeps getting better and better. I thought The Star Dwellers was wow-worthy but man! The Sun Dwellers is something else entirely. It's fan-freaking-tastic! I really love how David Estes didn't hold back on giving his characters a hard time. That sounds really terrible but hear me out for a second. It's one thing to make characters really kickass so they'll survive anything but it's another to give them tasks that are so hard you'll wonder for a split second if they'll all come out alive in the end. The Sun Dwellers had its fair share of violence and action similar to the previous books but this time around it's even more terrifying. Adele and the gand are given the toughest mission of all. It was a long and excruciating journey going to the Sun Realm. They had to fight off a lot of Nailin's men and deal with the exhaustion and emotional pain that came after. There were plenty of action packed scenes that had me both tensed and excited. 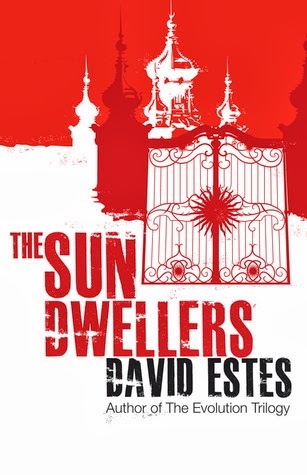 After reading The Star Dwellers, I came to know that anything, absolutely anything, can happen in David Estes' books. His creativity and boldness really livens up the story. Seeing their group work together and fight harder in this book was amazing. They're so much stronger here than they were before. Comparing them to how they were in the first book, I can't help but feel a sense of pride for them. It's like I got attached to all the characters, even the fairly new ones, along the way. Estes' character building was even better in this book. They really transformed throughout the series! Especially Adele. She was still the same kickass girl she was in the first book but somehow having Tristan around her so much softened her up a bit, but totally in a good way! Can we just discuss the romance for a bit? Estes put a twist into their little romance and it was... unexpected and unique! At first I wasn't so sure how I'd feel about it. It sounded so crazy but when I thought about it, they're deep underground for crying out loud. Anything can happen in this series. So yeah, I definitely loved seeing Adele and Tristan spend more time and develop despite everything that's happening around them. It wasn't fluffy romance that was out of place. Not at all! It was just right to give me feels and not disrupt the story's progress. The world building in this one was equally good. The way the Sun Realm was described sort of reminded me of The Capitol in The Hunger Games only less creepy. It was okay though because I enjoyed how they tried to blend in the festivities and how they figured out ways to travel faster. Plus it was a good break from all the fighting and drama. I especially liked that part where Adele and Tawni were trying to dress themselves in Sun Realm fashion. They were so out of it that it was funny! It also showed just how different and deprived the other realms were from the Sun Realm, which I think was a nice touch to the story. I was more than satisfied with how this story turned out. It had all the elements that makes a great Young Adult dystopia book. Detailed actions scenes, colorful world building, and a unique story line. You wouldn't be able to stop reading, that's for sure... which is great! Because The Dwellers Saga culminates in the fourth book, The Earth Dwellers which also happens to be The Country Saga's ending. 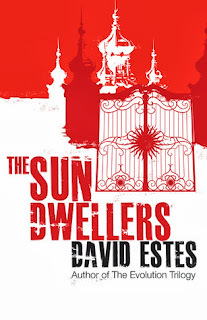 Basically, David Estes takes two separate stories and creates a mash of dystopia awesomeness! I've read Fire Country and it's also good. I can't wait to finish both series. I bet it'll be one mind blowing experience. Sounds amazing! I will definitely check out David Estes. Thanks for a great reading resource!